Summary: During a migraine attack, dopamine levels in the brain fall and fluctuate, a new study reports. This could help scientists better understand dopamine-based therapies for migraines as well as a patient’s behavior during an attack. The connection between dopamine and migraines has long been a poorly understood therapeutic and research area, says Alex DaSilva, assistant professor at the U-M School of Dentistry and Center for Human Growth and Development at the University of Michigan. Dopamine—sometimes called the brain’s feel-good neurotransmitter—helps regulate emotion, motivation and sensory perception. Physicians and emergency rooms often give migraine patients dopamine antagonists, drugs that block overactive dopamine receptors, to level off wild dopamine fluctuations and ease migraine attacks. DaSilva and colleagues took various measurements of brain activity and dopamine levels of eight migraine sufferers and eight healthy patients during migraine attacks and between headaches. They compared study participants to each other with and without headaches, and also migraineurs to healthy patients. When migraine patients were between headaches, their dopamine levels were as stable and even as the healthy patients, DaSilva said. But during an attack, the migraine patients’ dopamine levels fell significantly. 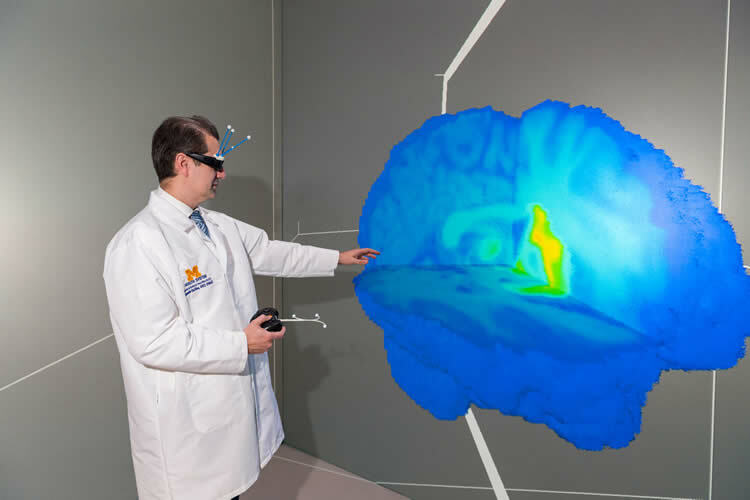 Outfitted with a joystick and special glasses, Assistant Professor Alex DaSilva examines 3D images of the brain to better understand brain chemical fluctuations during a migraine headache. DaSilva is in the Michigan Immersive Digital Experience Nexus, or MIDEN, on North Campus. NeuroscienceNews.com image is credited to Scott Soderberg, Michigan Photography. This supports the hypothesis held by some researchers that migraines are a periodic disorder characterized by sensory hypersensitivity during which light, sound and odors may become abnormally intense, Casey says. DaSilva says he was surprised when patients who were resting during their migraine attacks experienced a small dopamine spike and worsening symptoms when researchers applied warmth to their foreheads. This condition in chronic pain patients is called allodynia—when a stimulus that normally wouldn’t cause pain does. DaSilva says the sudden small spike in dopamine was probably an aversive reaction to environmental stimulation. This small fluctuation was only a partial recovery of dopamine, but it made the suffering worse because the dopamine receptors were highly sensitive by then, and even a small recovery would induce more nausea, vomiting and other symptoms related to migraine, he says. In addition to the pain of migraines, DaSilva says the fall in dopamine in general could also explain some of the isolation and withdrawal that migraineurs exhibit during an attack. “This dopamine reduction and fluctuation during the migraine attack is your brain telling you that something is not going well internally, and that you need time to heal by forcing you to slow down, go to a dark room and avoid any kind of stimulation,” he said. Source: Julie Gazaille – University of Michigan Image Source: NeuroscienceNews.com image is credited to Scott Soderberg, Michigan Photography. Video Source: Video is credited to University of Michigan. University of Michigan “Dopamine Levels Fall During Migraine Attacks.” NeuroscienceNews. NeuroscienceNews, 30 March 2017. University of Michigan “Dopamine Levels Fall During Migraine Attacks.” http://neurosciencenews.com/dopamine-levels-migraines-6314/ (accessed March 30, 2017). Objective: To evaluate in vivo the dynamics of endogenous dopamine (DA) neurotransmission during migraine ictus with allodynia. Methods: We examined 8 episodic migraineurs and 8 healthy controls (HC) using PET with [11C]raclopride. The uptake measure of [11C]raclopride, nondisplaceable binding potential (BPND), would increase when there was a reduction in endogenous DA release. The opposite is true for a decrease in [11C]raclopride BPND. Patients were scanned twice: one PET session was during a spontaneous migraine ictus at rest, followed by a sustained thermal pain threshold (STPT) challenge on the trigeminal region, eliciting an allodynia experience; another was during interictal phase. Results: Striatal BPND of [11C]raclopride in migraineurs did not differ from HC. We found a significant increase in [11C]raclopride BPND in the striatum region of migraineurs during both headache attack and allodynia relative to interictal phase. However, when compared to the migraine attack at rest, migraineurs during the STPT challenge had a significant sudden reduction in [11C]raclopride BPND in the insula. Such directional change was also observed in the caudate of HC relative to the interictal phase during challenge. Furthermore, ictal changes in [11C]raclopride BPND in migraineurs at rest were positively correlated with the chronicity of migraine attacks, and negatively correlated with the frequency during challenge. Conclusions: Our findings demonstrate that there is a reduction and fluctuation in uptake of [11C]raclopride during the headache attack and ictal allodynia, which indicates an imbalance in ictal endogenous DA release in migraineurs. Moreover, the longer the history and recurrence of migraine attacks, the lower the ictal endogenous DA release.